Reading many other reviews about the 5th book and after reading it I tend to agree yet disagree with some! HP 5 was highly energetic and very much detailed and complex for me which really kept me going! Although! maybe it was the 870 pages (136 pages more than HP4) that made the beginning seem to take longer to reach interest? i don't know but once I did reach that point (I mean HP completely boring?! never!) I couldn't put the book down after that point. I never really was one of those passionate people that read the book first than went to a movie and said "WTF?!!" cause I always took a movie for exactly what it was "A Movie." Now! I find myself saying why didn't they put this part in?!! and where is this part?! All the more reason for being glad to be an avid reader and that there are books to add more clarification to the "whole story" still would of been nice to see all those vivid descriptions put to film but beggars can't be choosers so I am reminded. Until my next review Happy Reading All!!! Harry Potter what can I say? 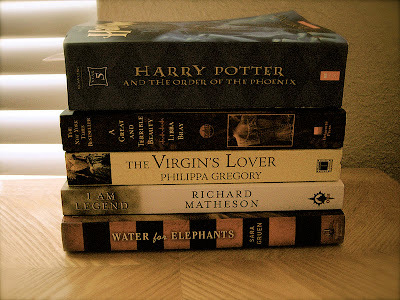 Other than I realize I am not a kid but how can I not love Harry Potter books? They are absolutely brilliant and i will definitely keep them to read to my future children (if i come to the point of having kids). I have just finished the thirty-seven chapter, 734 page (4th) book of the Harry Potter set and I cannot say anything bad about the book it has everything! It was a complete page turner and so easy to read! I think my favorite parts easily of this book is the dark intricate scenes and detail the book goes into, to keep the reader involved. Overall my favorite Harry Potter book by far! 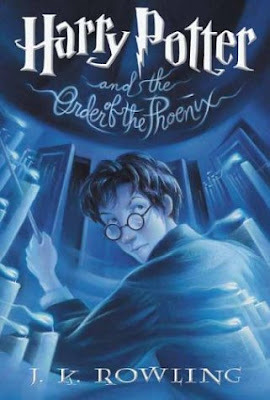 I have now just started the 5th book Order of the phoenix and although I have already seen the movie for the Order of the Phoenix I have heard from many that the movie doesn't do justice to the book. So we shall see! All in all I give this book 5 stars and would recommend it to anyone especially those kid at heart types like me! Until my next review Happy Reading All! !